Italy, 1974, 111 minutes, Colour. Marcello Mastroianni, Lea Massari,	Mimsy Farmer, Laura Betti, Renato De Carmine, Bruno Cirino, Claudio Cassinelli, Benjamin Lev. Directed by Paulo Taviani and Vittorio Taviani. Allonsanfan was written and directed by Paolo and Vittorio Taviani. They were to achieve fame and commercial success with Padre Padrone, which won prizes at the Cannes Film Festival in 1977, and was acclaimed at festivals and in popular screenings. The Taviani brothers come from the Italian Left. Their stories represent and communicate issues from the Left. 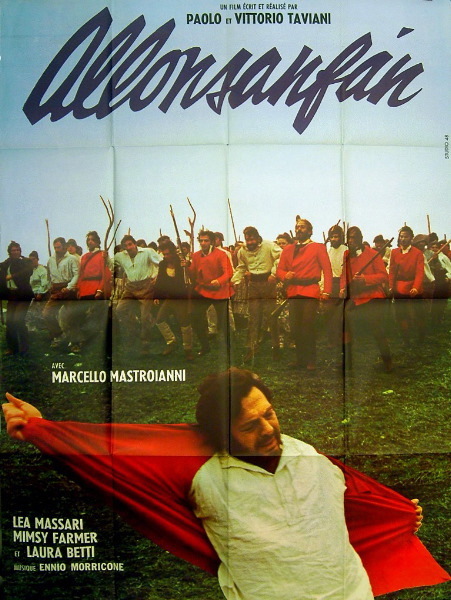 This film, set in 1816 in revolutionary Italy, is seen as a parable of the Italian Left in the mid?'70s. The film criticises and attacks three elements for weakening the stances of the Left, the rich bourgeois intellectuals who opt out when things are difficult, the revolutionary adventurers who are naive troublemakers and cannot achieve what they set out to do and left wing sectarianism and the subversion of unity and solidarity. These people are embodied in Fulvio the aristocrat played by Marcello Mastroianni, the Sublime Brethren, a secret revolutionary sect which has great ideals but does not succeed, and the various members of the group who cannot agree and therefore fail in their aims and break up the unity of the group. The film is visually rich with an excellent re-creation of the period, using special editing and colour effects. The film also is melodramatic in the operatic vein and the Taviani brothers themselves believe that many sequences were born from the music. That the music should be a protagonist of the film. The score is by Ennio Morricone, the very popular and versatile Italian composer, but the themes derive from opera. The title of the film and the character called by this name remind us of the French revolutionary anthem, The Marsellaise and its first words, Allons enfants. The film is an interesting example of commercial experimentation and political moviemaking. 1. The impact of the film? Entertainment, moralising, didactic parable, political film? The work of the Taviani brothers and their interests? The theoretical basis of the film, realism and contrived presentation of historical and political themes? The point of view of the Left and the critique of the Left? 2. The impact for Italian audiences of the '70s, later? The European background and the response of European audiences? The difference for American, Australian audiences etc.? How universal the thews of the film? 3. The emotional impact, the presentation of human nature and its ambiguities, human nature in a historical and revolutionary setting, human nature and war? Politics and the various human responses? The interrelation of history, revolution, war? 4. The contribution of the colour photography and the special effects, the tableau effects, the use of close ups, the sense of motion? Long shots and the beauty of the locations? The editing and pace? The buildings and the variety of settings within Italy itself? Poverty and wealth? Land and seascapes? The beauty and yet the violence and the irony of revolution and futility? 5. Morricone's musical score, its value in itself, its being part of the texture of the film? The Italian tradition of opera, popular folk music, contemporary musical styles? 6. The dramatic effect of the plot and characters, the re-creation of a period, immersing the audience in the period, the epic tones with war and revolution and Italian patriotism, the comic effects of the foibles of human nature and human stupidities? The parallels with opera? 7. The basic political thews and stances: revolution and the background of the French Revolution, Napoleon, Italy's role and its experience in the decades prior to the film's setting? The title and its reference to the French Revolution? The calling of the boy Allonsanfan? His father and his leadership, suicide? Allonsanfan embodying the revolutionary beliefs? The establishment in the Italian states in the early 19th century, the restoration after Napoleon's invasions? The bourgeoisie and their power, the return of the aristocracy? The background of police,, prisons,, cruelty, military, spies? The populace and government, the Church, plague? The cholera epidemic? The naivety and hopes of people at the time? The trust in revolution? The need for political change and questions of how change was to be achieved? The purpose of this looking back to Italian history from the 1970s? As a mans of interpreting the present? 8. The Sublime Brotherhood as a secret sect, its role in history, its ideals, the variety of personalities in the group? Tito and his leadership, influence? Lionello and his loyalty? How well did the film draw the characters of the various people in the Brotherhood? Their presence, relentlessness? Fulvio and his link with them? His description of them. his loathing? Their vindictive attitudes? Their being destroyed by the soldiers? Their persistence, their devices for continuing, costumes etc.? Their pursuit of Fulvio? The build-up to the voyage? The landing, the hopes of the Brotherhood, their betrayal and massacre? The ritual dance and its effect? The music accompanying the presentation of the Brotherhood? Audience sympathy for them, seeing them through Fulvio's eyes, admiration for their ideals? 9. The choice of Marcello Mastroianni to play Fulvio? A strong Italian actor portraying a coward? Audience interest in him at the beginning, sympathy? His release from prison? His not being a traitor? The hanged man? What brought about the change in Fulvio? His being used by the authorities? His discussions? The ironies in his life, especially as he returned how? His disguise as the friar, the home, the meal? Death and illness in the family? The portrait of the family and his looking at them through coloured filters? Esther and her antagonism? His love for Charlotte, the importance of finding his son? The betrayal and the flight? Charlotte's death and the kidnapping of the boy? The importance of Massimilliano for him? The funeral and his escape? Taking his boy with him ? the bonds between them e.g. the meal, the ice cream? Arriving at the boarding school and Fulvio wanting his son to be educated and grow up well? The toad? Fulvio's encounter with Lionello? Lionello's fanaticism, the inevitability of his death and Fulvio's role? Francesca and the carnival in reality and imagination? His seduction of her? His plan to escape the Brotherhood? The potion and the betrayal? Allonsanfan. 's story? Fulvio and his desperation to escape, his betrayal of the Brotherhood to the priest, his believing Allonsanfan and the irony of his death from the authorities who were to protect him? How well delineated was the character? The portrait of a bourgeois aristocrat, tempted by revolution but opting out in difficulty, experiencing persecution and the relentless Brotherhood, betraying them and the experiencing of a useless death? 10. The effect of such sequences as the presentation of Fulvio's family - especially the mal? The family interests? The effect of the soldiers coming and the siege? 11. The portrait of Charlotte, her love for Fulvio, her helping, the boy and holding him for Fulvio, her death? 12. The contrast with Francesca? the funeral, her love for Lionello, the effect of his death, allowing herself to be seduced, the departure? 13. Tito and his leadership of the Brethren, his intensity, reliance on Fulvio, deception? 14. Lionello and his role in the Brotherhood, his tracing Fulvio and finding him, the relationship with Francesca, the build up to Lionello and his suicide, the lake? 15. The importance of Vanni Gavino, Vanni Peste? How integral to the development of the themes? 16. Fulvio and his awareness that he was being taken to South Italy, the arrival, the funeral village, the violin and the gallery? 17. The carnival and the pseudo birth? 18. The townspeople, the cholera, their fear, the build-up to the attack? The impact of the ritual dance advance and the massacre? The ironic farce aspects of Fulvio's death? 19. What was the audience left with in its experience of this piece of history, politics and its heightened melodramatic impact?